(CEEDS) | We are Smith College's Center for the Environment, Ecological Design, and Sustainability. Call us CEEDS. 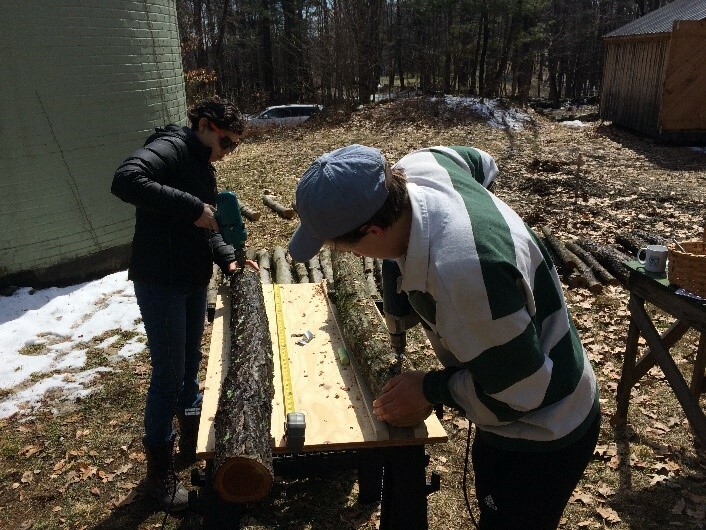 This the second in a series of posts written by students in LSS110: Interpreting the New England Landscape, which takes place at the MacLeish Field Station each January. We began the morning with Naila Moreira, a visiting professor who helped us define the term creative nonfiction, as a mode of writing that places a narrative upon the events of life as they are experienced, and draws on background knowledge to supplement these stories. We discussed the components of creative nonfiction, which included a plot, character development, voice, emotion, and sensory imagery, and also discussed the importance of relating to the reader, and allowing the reader to see themselves in the author. We then discussed the Arts Afield program, which aims to create a 200-year archive of artists’ work at and inspired by locations within the field station. Then, we were prompted to call out words that we associated with the field station. Naila prompted and guided us toward various types of words we hadn’t yet explored, such as ones with intense emotional or negative connotations, or multiple layers of meaning. We came up with an extensive list that ranged from animal and tree names, to emotions and feelings. Some that stood out to us were ghosts, invasive, traces, abandonment/ed. Keeping these words in mind, we then went out to the porch swing, which is one of the Arts Afield locations, to observe, sketch, write, and collect objects to suspend within ice suncatchers. The electric fence was off (which was lucky, since all of us rolled or crawled under it to get to the swing! ), and there were cows in the pasture, but they got spooked soon after we arrived. We all spread out and began engaging with the landscape as individuals. Rays of sunlight broke through the clouds as we all sat in the quiet to reflect and observe. After about 30-40 minutes of writing and reflecting, we walked back to the building. Naila prompted us to come up with a metaphor, a character, a feeling or emotion, and a question we had following that experience, and invited everyone to share one of those things. Then we spent some time crafting a more polished narrative, but Naila assured us that they didn’t have to be good, which was liberating. ash dusts rhythms of life. Then we ate lunch and made suncatchers out of some plants we found outside! To do that, we filled bowls with water, inserted a piece of string, and the plants we had found earlier, and set them outside to freeze. Using these questions, we talked about various reactions to the artwork, and learned about the history of Dan’s work and presence at the field station. We discussed the beauty of his work, but also the elements of torture and interference with nature. His work directly tackles questions of the natural and unnatural, and the ethics behind it are mystifying; however, if we consider human beings as part of the landscape rather than separate from it, perhaps his work is quite natural after all. His reach across the space was broader than most of us realized, as he seemed to tinker with every bit of property he could get his hands on! We discovered much of his work on our walks through the woods. Next time we hike through the field station, we’ll be sure to keep our eyes open for new creations. Some flurries began, and we headed back inside. We then began planning for Friday’s activities with the sixth graders, by first brainstorming about examples of effective teaching we remember from our preteen years, and then brainstorming about how we wanted the morning to be broken up. Since there are three main areas we’ve been working with, we decided to create three stations, one about science, one about history, and one about art. We students were in charge of coming up with the three activities, and breaking ourselves into groups. Then, we worked more closely with our group members to narrow down our ideas and consider logistics. Everything seemed to come together really well, and everyone seemed excited about their different roles in helping the plan for the day take shape. To finish, we all gave one word that we felt was connected to our experience of the day, and then wrote blue post-it notes to stick on the map. It was a beautiful day of exploring, together and individually. Our words of the day were authenticity, liminality, ghosts, individuality, presence, hybrid, long term, contorted, expansion, observation, being, structure, and creativity. You might think the MacLeish Field Station would go quiet in the winter, but each year students spend one week of interterm there in a unique class called LSS 110: Interpreting New England Landscape. In this course students experience the natural cultural history of the New England landscape, and develop educational activities that explore ways of sharing the significance of MacLeish (and the broader New England landscape) with a variety of audiences. The week concludes with a visit by local 6th graders who learn from the students. The following series of posts were written by students in LSS 110 this year over the course of their class. Our first day in LSS 110 took us through the woods with Jesse Bellemare to identify some trees and investigate an 18th century homestead site. I found the deductive analysis of the site fascinating; though I’ve studied some archaeological digs from pictures, I’ve never been on the ground exploring a historical site like this before, after nature has reabsorbed most of it. The site reminded me of my work at Old Sturbridge Village this past summer, so I could vividly imagine the house standing new, the pathways to the well and the barns, the vegetable garden alive with beans and turnips and carrots, and the Waite family going about their constant daily work. Because I’ve been immersed in such scenes recreated at OSV, it was sobering to pass through it as a visitor from the future. I felt reality shimmering, like the layers of time between our present and the period of active use of the site were superimposed. It made me think of a book I’m currently reading called Haunted Landscapes: Super-Nature and the Environment, which is about what makes landscapes “haunted” and what “haunting” entails; it reads, “A haunted landscape deconstructs itself. Boundaries, borders and spaces themselves dissolve in fluid reconfiguration as that which haunts, movies in and out, here and there, in-between and nowhere (6).” Essentially, a haunted space is a liminal space between worlds that evokes a visceral, emotional reaction. At the homestead site I felt such a reaction, and I knew that ghostly forms were slithering all around me. Not only had the house fallen apart, but the edges of reality also dissipated. It was a place where time and space were broken down. I felt that liminality twice on Monday; the first was in the morning at the homestead site, and the second was in the afternoon, when I wandered down the field past the swing, through a little gateway in the stone wall. I’m always looking out for gateways in nature–I’m not sure what I think built them, but I feel strongly that they mark doors into otherworlds, sacred spaces, and haunted sites. I looked up at a tall white birch that resembled a long femur, and got a distinct sense that my eyes were not showing me what was really there. In British folklore, this is called glamor, a trick of the fairies to hide their world from human eyes. Often in nature I feel that my eyes are filled with glamor, and that if the glamor were removed I would be able to see something magical. This birch seemed to shimmer with glamor, and I suspected it might be an elemental being taking the form of a tree (I know this sounds very odd, especially in an academic context, but I believe everyone builds their own reality and I see no reason not to build mine to be enchanted). The gateway was a liminal space into a landscape populated by fairies, externally resembling our everyday landscape, but a shade different. I got the feeling I was coolly tolerated there. I checked the time and was surprised to see that it was almost 3, and I had to hurry back to the building. That makes sense–time is loose in fairy country. It’s easy to forget that you need to leave. I wanted to stay out and wander far away, as though in a trance or a dream. I enjoyed making my event map because I could illustrate these feelings and ground them in the landscape, like with that birch tree. I could mark the moments of passing through, the entrances to different realities. I will definitely employ this activity in the future. I venture away from the innate security of the warm Bechtel Environmental Classroom and out into the brisk midwinter afternoon. The sun may shine down on my path, but the air stubbornly chills my body regardless. As I walk I allow my steps to carry me wherever they see fit. A recent conversation about the moon sticks in my mind as I glance up to study her waxing form, nearly halfway through the process of returning to a complete orb in our sky. What causes the moon to appear in the daytime sky as she does right now? Is she always there? Have I simply taken her for granted and failed to notice her other days? Whatever the case, she is here now and I sketch a picture in my fieldbook we had made a few short minutes ago. I continue my path away from the warmth of the building and tromp through fierce bristles and dogwood, noticing the intricate weave of slim branches as they dance across my path and intertwine with their neighbors in tight nets. Some bundles comply politely with my footsteps and generously slip to the side. Others, however, persistently swoop in front of my destination, thorns catching my jeans as I pass through. While these bundles of inconvenience are not an inherently pleasant addition to my adventure, I respect and appreciate their place in nature’s world and mark their forms into my book. Farther along the woods a moss-laden stone wall interrupts my path. As we had learned earlier in the morning, this orderly wall and all of its companions formed from the scattered hillsides when English invaders demolished the ancient forests and cleared these same rocks from their plough fields and pastures. These settlers needed boundaries for their farm animals, and Mother Nature provided as she always does. I walk over the stretching row of stone and consider the generation that engineered this structure. Whose hands carried these rocks? How long did the stones live in solidarity before man interrupted and united them with hundreds of companions in a single row? How long will it be before nature truly takes over and erases the evidence of such intentional reconstruction? Who will walk this path long after I have gone? I cannot know the answers to these questions, but I can note my time and experience with these rocks. I sketch the wall in my book and continue down my path, stepping on red berries and listening to the birds flying above who have no doubt enjoyed their sweetness. My field book welcomes these additions and I continue. As I hop a modern wire fence which attempts to block my path, I note the cow patties that now greet me on my path. I sketch these remnants of a living creature and wonder how long it’s creator has been away. A day? A week? When will this animal return? Will it come with its friends to leave additional impressions on their land? I leave these animals’ home and climb through the fence back toward the classroom. I take a final turn and am on route back to the promise of heat and chocolate that awaits me, but before I get too close I take a final detour. I find a stretching log on the ground and sit, watching the movement of leaves in the wind, listening to the babble of the frozen creek, smelling the dirt and decaying leaves surrounding me, and feeling the cool bark under my jeans. Growing on this collapsed log to my left is fungus, stubbornly perpendicular to the log, defying gravity and refusing to fall. On my left, a creature has torn the bark away and drilled holes into the side. Was this the work of a woodpecker? Perhaps another bird or hungry insects? How many animals seek food or even shelter in these crevices? I know only that I am a visitor in their world, a brief inconvenience at most. Nature and her life will be here after I go. She has always been and always will be. After all of us temporary visitors have gone, some of us wounding her and some of us trying to help her, she will continue on her way. This dead and decaying log may seem dead, but it is full of life. It supports the other creatures of the forest even after it could no longer support itself. I mark its shape and growing companions in my book and take the last steps back to our man-made building. How long will this building itself remain here? Will nature’s eternal impact ever erase the presence of anything other than trees and rocks and animals and other growth? I may never know the answers to any of my questions, but I do know that this land has no regard for what I wonder, and the stretching time of this environment humbles my perspective on how I interact with the natural world around me. If you’d stumbled into the right room of the theater building this spring, you might have been startled to see sixteen Smith faculty and staff staring fixedly at the floor, walking random circles around each another, in total silence, as if they’d gone mad. You might have been more startled still to hear that those faculty were at that very moment practicing pioneering new methods to communicate scholarly and scientific work to the public. The group, including myself, was taking part in a program brought to Smith by the Alan Alda Center for Communicating Science, run out of Stony Brook University. Founded by famed actor Alan Alda of M*A*S*H, the center brings workshops to academic institutions around the country. Before founding the center, Alda had long taken an interest in science communication, hosting the Scientific American Frontiers program about popular science from 1993 to 2005. In working with scientists for the show, he realized that many of them had no idea how to effectively talk to journalists, much less the public. Scholars seldom have trained to reach broad audiences. Normally, they work either alone or with other specialists, reporting their work to audiences of highly-trained peers and relying on technical jargon and complex detail to get their points across. The theater exercises Alda had learned as a budding actor, he realized, could prove as formative and life-changing to scholars as to theater professionals. Rooted in improvisation and collaboration, the exercises help teach participants how to create human connection. With study after study showing that information alone can’t change minds, building that interpersonal rapport may prove as crucial to sharing knowledge as providing the facts. “If what you’re worried about is how do I look, how do I sound, will I remember the hard words, am I saying this in exactly the right way, then you’re not really communicating. You’re in your own head,” Alda has said, about what he hopes the techniques will change. That’s how Smith faculty found ourselves walking around the room, first staring at the floor, then switching to looking each other in the eye, then saying our names as we looked at each other. The exercise calls attention to the power of body language, too often ignored by scholars when reaching out to the public. Focusing on how one’s body takes up space in a room can offer novel insights, especially from the vantage point of a career based on books, calculations or scientific instruments. The workshop also emphasized the power of story to get information across to others. Scholars’ personal experiences and memories, when shared, can humanize research, pointed out workshop leaders Radha and Elizabeth. Alongside the theater exercises, the workshop participants created and presented our own short narratives of how we got into our areas of research, with some striking results. Suzanne Gottschang, a medical anthropologist, described how as a Masters’ degree student in public health, she took a class on infant feeding. While in the course, she happened to have four friends become pregnant at the same time. In the middle of the night, one of those friends called her, in tears. Within days, a second friend called, weeping about the same problem. Both friends had given birth successfully but were struggling to breast-feed their new babies, who wouldn’t accept the breast no matter what they tried. Both women felt like failures, like terrible mothers, like something was wrong with them. Her friends’ struggle combined with what she was learning in class, Gottschang said, kicked off thirty years of following research. Now, she studies the commercializing of infant feeding in China. Despite a huge campaign to encourage women to breastfeed, Chinese breastfeeding rates have been declining. The contradictions in expectations that women experience during early motherhood, Gottschang explained, likely contribute to the decline, but they’re seldom talked about. Stories like Gottschang’s create emotional connection, quickly making clear why her research matters – a far cry from simply reporting breastfeeding rates around the world. Gottschang said the workshop offered her a welcome opportunity to think about reaching audiences in different ways. “Looking for those connections, finding those, I think that was really profound, both on an individual level and with a larger audience,” she said. 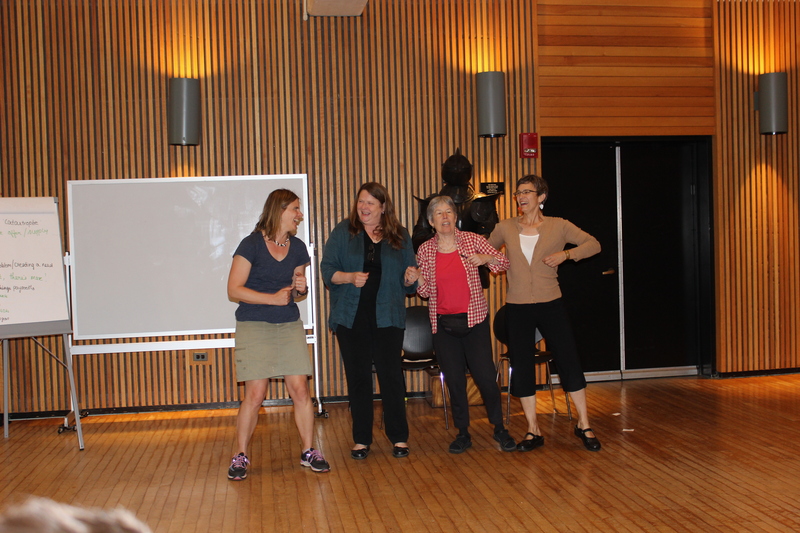 The Alda techniques are likely to enter teaching practice across Smith campus. 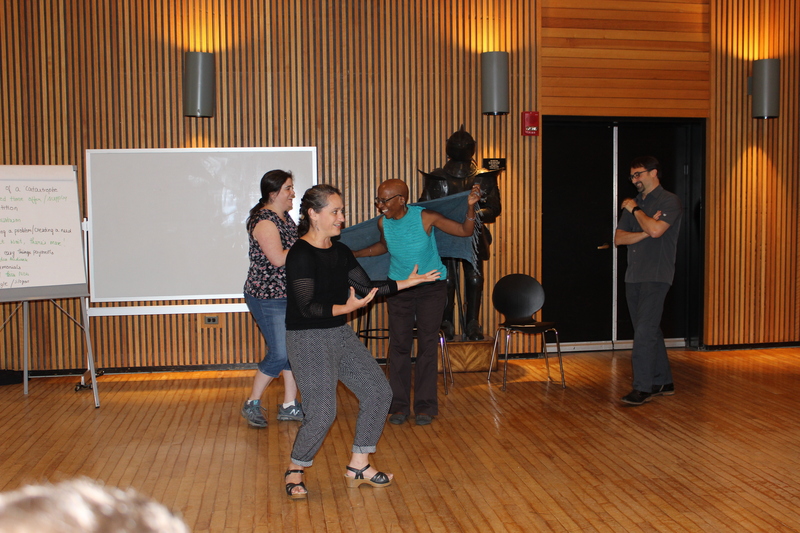 For instance, I’ve used the improvisation and theater exercises with AEMES students, and will also be using a variety of the improv and storytelling techniques this year in ENV 311, an environmental communication class. Several faculty have told me they plan to do the same, including Zhang-Gottschang and astronomy professor James Lowenthal, who helped bring the Alda program to Smith after attending a previous workshop. From when I was a kid until I went to college, I performed yearly in a summer theater. There, I remember the shyest young man I ever met, a nine-year-old whom I thought could never manage to overcome his fears to perform onstage. He could barely look up from his feet. Over our years at the theater, my friend became the most outgoing, vivacious, gracious person I can imagine. I can’t prove the theater’s training created the change, but I’m convinced that’s what brought him out of his shell. If the Alan Alda Center for Communicating Science can reproduce even a fragment of that magic, lighting an extroverted spark within the famously reclusive academic disciplines, it’s worth looking like a madwoman for the day. 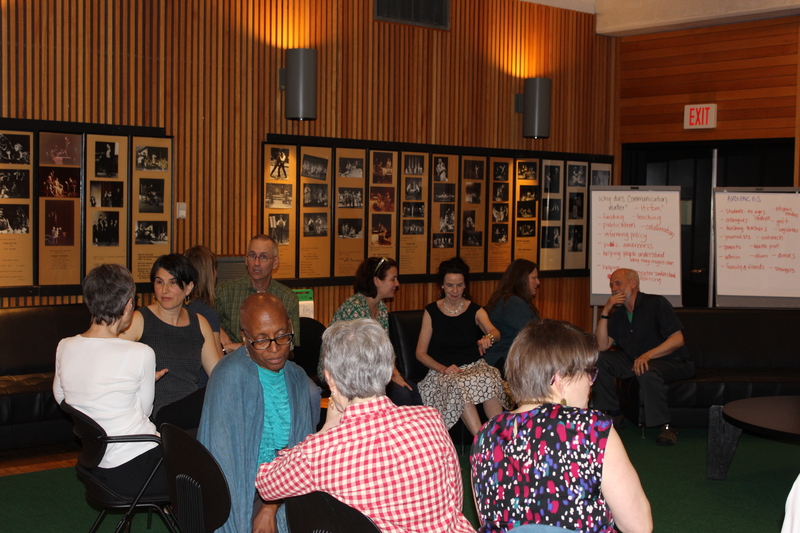 Attendees at the May workshop included Alexander Barron, Nathanael Fortune, Katherine Halvorsen, Suzanne Gottschang, Valerie Joseph, David Bickar, Greg White, Susan Sayre, Virginia Hayssen, Joanne Benkley, Michael Barresi, Patricia Mangan, Molly Falsetti-Yu, Jessica Bacal, and Amy Rhodes, and Naila Moreira. -Naila Moreira is a nature and science writer and poet. She teaches in the Environmental Science & Policy Program and English department, as well as in the Jacobson Center. She likes birdwatching and ultimate frisbee, and has a fondness for offbeat critters like salamanders, katydids, bats and snakes. Anti-Climate Change Diets: Do We Have to Go Whole Hog? Americana cuisine culture is undeniably tied to climate change. From the all-American pastime of baseball to the nostalgic county fairs to the backyard barbeques, America has long embraced and embodied a culture of hotdogs, hamburgers, barbeque, bacon, etc, etc. Per capita, Americans eat the second largest amount of meat in the world, and unsurprisingly, the United States is the second greatest global greenhouse gas emitter. If all Americans went vegan, a diet in which no animal products are consumed, greenhouse gas emissions from the meat and dairy industries would be eliminated, which would likely slow down climate change significantly. However, such a national transformation remains out of the picture thanks to American food culture as well as economic reasons involving accessibility in low-income, low-access areas and political reasons such as government subsidization of meat and dairy industries. Nonetheless, being deliberate about what we eat can make a difference in helping fight climate change; not all meat-containing diets contribute equally to carbon emissions. In an ideal world, we would just cut animal products from our diet cold-turkey. That is, no more meat, no more eggs, no more dairy products. A study in the journal PNAS calculated that if farmed animals were removed from U.S. agriculture, there’d be a 28% decrease in our agricultural greenhouse gas emissions and a 23% increase in total food production. Meat production is so resource-intensive and consequently emission-heavy because one must account for all of the resources it took to raise the livestock. For example, to calculate the carbon footprint of one adult cow before being slaughtered, many factors must be included — the energy inputs needed to grow the feed, the nitrous oxide emitted by fertilizer, the feed itself, and the cow’s methane emissions. This doesn’t even include the cost of slaughter, processing and transport to market and then to the dinner table. While many people choose a vegan lifestyle as an environmental action, just as many choose to eliminate animal products for health and moral reasons. According to the International Agency for Research on Cancer and the National Toxicology Program, processed meats qualify as a Group 1 carcinogen, i.e. when consumed, they are known to cause cancer in humans. In addition, many are familiar with the brutal and violent imagery that often defines the treatment of all kinds of animals in the meat and dairy industry. However, morals, ethics, and health concerns aside, even if solely for the environment, it makes sense for everyone to go vegan or at least vegetarian. Snap back to reality and it’s clear that it’s not reasonable to hope that Americans will be willing to make such a dramatic change to their diets. Meat is deeply embedded in American food culture. The Organisation for Economic Co-operation and Development (OECD) reported in 2015 that Americans consume 198.5 pounds of meat per person, per year. For comparison, Koreans eat 113.5 lbs per capita, per year and Filipinos eat 63 lbs per capita, per year. One end of the dietary spectrum is a meat-heavy diet and the other end is veganism. Although a national leap from the meat-heavy side to the vegan side isn’t likely to occur all at once, our environment isn’t necessarily doomed. As Maya Almaraz, a postdoctoral climate and environment researcher at UC Davis, notes, “eliminating 90 percent of your meat intake is more important than eliminating all of your meat intake.” Similar to starting a strict diet or making a well-intentioned New Year’s Resolution, people who abruptly switch to a vegan/vegetarian lifestyle often find the changes challenging and as a result end up giving it up over time. Almaraz points out that a sustained lifestyle which includes small amounts of meat is better than having an all-or-nothing attitude. Making a shift towards the vegan side is better than doing nothing. With this mindset, there are many diets cropping up that are less restrictive, more forgiving twists on veganism and vegetarianism. U.S. News & World Report ranked the top diets of 2018 in terms of simplicity, good nutrition, safety, weight loss (both long and short term), and protection against heart disease and diabetes. Their scoring was compiled by a panel of 25 nationally recognized health experts, including professionals like Michael Dansinger, Teresa Fung, and Penny Kris-Etherton. Dansinger is the Founding Director of the Diabetes Reversal Program at Tufts Medical Center, Fung is a professor of nutrition at Simmons College and Harvard School of Public Health, and Kris-Etherton, having published over 300 scientific papers, has studied the diet-heart disease link for over 30 years. Among these rankings, the Mediterranean diet was first, and flexitarianism was third. Perhaps surprisingly, vegetarianism ended as 10th, and veganism finished 19th. Evidently, the diet rankings focus on health factors, so the diets to be discussed must still be evaluated for their environmental impacts. Environmentally, the Mediterranean diet gives vegetarianism and veganism a run for their money. Vegetarians don’t worry about killing innocent animals, and vegans have the added benefit of not having the harm of livestock for other products like eggs and milk on their conscience. Yet in terms of environmental cost, the Houlton Lab at UC Davis found that the Mediterranean diet emits slightly higher levels of carbon dioxide equivalent than vegetarianism or veganism. Results modeled by the Houlton Lab. 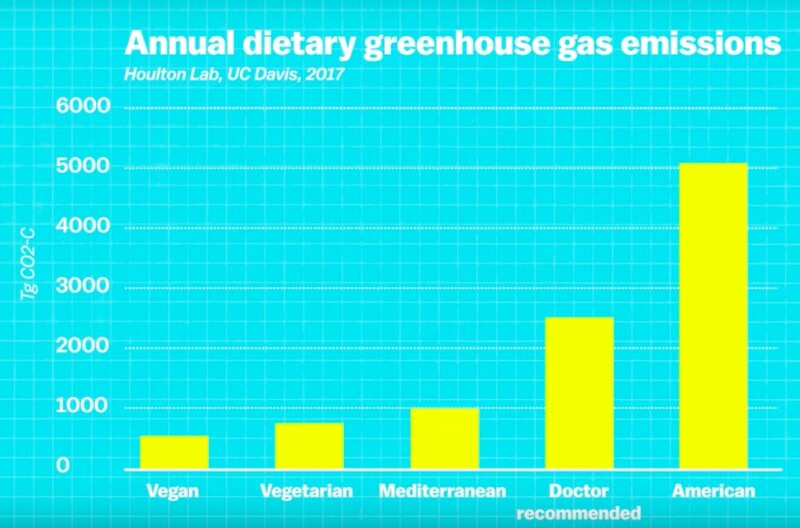 Vegan, vegetarian, and Mediterranean diet emissions are much lower than emissions by Doctor Recommended and Normal American diets. In the Mediterranean diet, adherents eat a lot of fruit and vegetables, nuts, whole grains, fish, and olive oil. Chicken is consumed occasionally, and red meat is eaten rarely. The reduced emissions in this diet support the idea that not all meat contributes equally to greenhouse gas emissions. The Houlton Lab also did calculations of how much carbon is emitted per serving of various foods. Beef creates 330 g. By simply eating chicken instead, that number becomes 52 g, and for perspective, lentils emit 2 g/serving. The Mediterranean diet might also be an appealing option for the environmentally conscious because of studies like the one in the journal PNAS that modeled the scenario of a meatless America. Although researchers White and Hall found a decrease in greenhouse gas emissions and an increase in food production, they also concluded that without meat there would be a deficiency of micronutrients like vitamins A and B12. In modeling a diet on a population scale, the apparent challenge is making sure diets meet micronutrient requirements. Interestingly, there was an excess of macronutrients like proteins in both animal and plants-only systems because modelers bumped up the amount of protein in attempt to increase micronutrients. The Mediterranean diet easily meets government nutrition recommendations, and people following this diet would likely not run into such deficiencies. 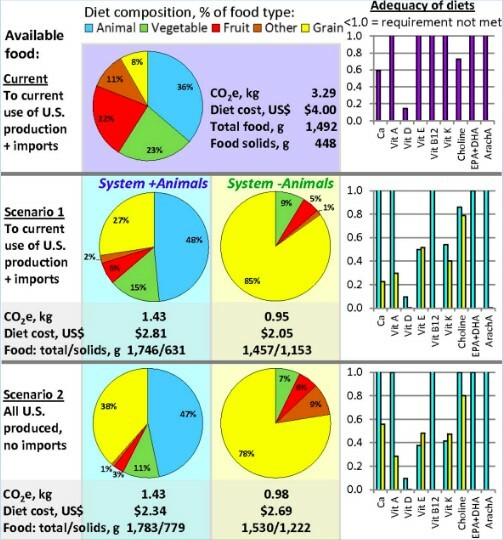 A graphic from the study modeling a meatless U.S agricultural system referenced above. In many cases the system without animal food sources had inadequate or reduced micronutrients. Flexitarianism is another diet growing in popularity. In 2016, 22.8 million Americans self reported as flexitarians- more than three times the 7.3 million who identified as vegetarian. Flexitarians, or “flexible vegetarians”, are vegetarians who allow themselves to eat meat once in a while. This diet focuses on plant proteins, or “new meats” like tofu, beans, nuts, and eggs instead of focusing on animal proteins. Flexitarianism could be the solution for those who are conscious of their health and the harmful effect that meat production has on the environment, but who are not quite willing to commit themselves to giving up entire food categories. Similar to the Houlton lab findings, a research team at Oxford University quantified the pattern of a reduced carbon footprint with reduction of meat intake. 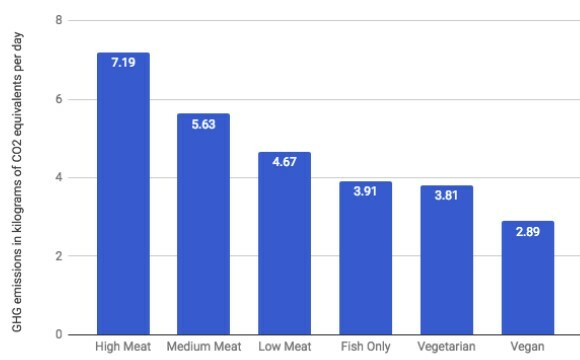 Comparing the emissions of high, medium, and low meat-eaters, fish-eaters, vegetarians, and vegans, they found that the average greenhouse gas emissions in kilograms of carbon dioxide equivalents per day (kgCO2e/day) progressively decreased as meat content decreased. For example, the high meat-eaters emitted 7.19 kgCO2e/day, a low meat-eater emitted 4.67 kgCO2e/day, vegetarians emitted 3.81 kgCO2e/day, and vegans emitted 2.89 kgCO2e/day. A flexitarian would likely qualify as a low meat-eater, and emitting 4.67 kgCO2e/day is certainly more ideal than emitting 7.19 kgCO2e/day. With each new diet and subsequent new name and following, the distinctions seem to be minor because the goals are so similar. Reducetarianism is different from Flexitarianism in that the goal is to reduce “with respect to [one’s] own diet”. Flexitarianism was popularized as a way to be vegetarian without feeling the guilt and doubt of not being a “real” vegetarian whenever there might’ve been a slip-up in eating. Other consumption patterns that defeat the all-or-nothing mentality of certain diets include Weekday Vegetarianism, the Vegetarian Before 6 (VB6) Diet, and Meatless Monday. On a global scale, in 2012, it was reported that food production makes up one-third of all anthropogenic greenhouse gases. In 2008, livestock production was associated with 18% of global greenhouse gases, including 37% of methane and 9% of carbon dioxide. Any decrease in these gases could mean getting closer to stopping the widespread destruction humans are bringing to Earth by climate change. Like Peter Singer, the moral philosopher, says, “reduce now, and next month, reduce more. Maybe you’ll get to zero, and anyway, you’ll be doing less harm.” Similarly, in the Three R’s, it’s helpful to remember that “reduce” is the first but also the most important. Doing something is better than doing nothing, and with every meal, there’s the opportunity to do something. Of course, diet is not the end-all of action against climate change, not in the slightest. As of 2014, globally, the transportation sector emitted 14% of global greenhouse gases, and the agriculture, forestry, and other land use sector emitted 24% of the total emissions. It’s incredible that agriculture emits more greenhouse gases than those from all cars, trains, planes, and boats. The argument goes that if we eliminated the meat and dairy industries from agriculture, we’d be in the clear. But in the grander scheme of things, even if both agriculture and transportation were made completely emission free, the world would still be generating well over half of its current emissions. -Rachel Estrera (‘21) intends to major in neuroscience major. She is an Aries who enjoys reading memoirs, eating ice cream, and watching Studio Ghibli movies. She lives in Lamont House. Coral Reef Ed-Ventures is an environmental education collaboration between Smith College’s Environmental Science and Policy Program and the Hol Chan Marine Reserve on Ambergris Caye, Belize. This program for local children, which runs each summer on the island in Belize, is currently led by Professor David Smith (Biological Sciences and Environmental Science and Policy) and Dr. Denise Lello (Lecturer and Research Associate in Biological Sciences and Environmental Science and Policy). Coral Reef Ed-Ventures began 19 years ago with two Smith student teachers and a few children. This year’s team comprises six Smith student teachers who will engage over seventy children in two education camps! 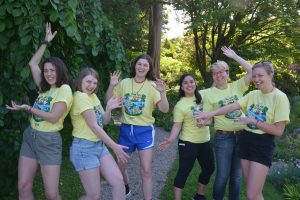 This year both of the camps (The REEF Program [Advanced] and the Youth Program) are organized around the theme CONNECTIONS: participants will explore the connections between nature, the environment, and the community. The campers will also be introduced to research methods like mapping and coral identification, techniques the student teachers will themselves use when they analyze the data they collect in Belize. L to R: Aidan Coffin Ness ’20 (SPN/EDC), Katherine Akey ’20 (EGR), Carla Schwartz ’20 (BIO/MSP), Dana Vera ’19 (EDC/MTH), Liz Nagy ’18 (ENV/EAL), Emiline Koopman ’18J (BIO/MSP). The students are just starting week 4 in Belize. You can see pictures and read more about their experiences on the Coral Reef Ed-Ventures blog. The Coral Reef Ed-Ventures program could not function without the generous financial and in-kind support of the people of San Pedro, Belize; the Hol Chan Marine Reserve; the Environmental Science and Policy Program; generous alumnae donors; the Center for the Environment, Ecological Design, and Sustainability; and sources of endowed student support, including the Agnes Shedd-Andreae ’32, and B. Elizabeth Horner Funds. Thank you for your support! During my childhood, as soon as it turned dark outside, my father would become frantic and check whether all the windows and all the outlets to the outside world were closed. I could hear his voice from across the house shouting, “We cannot let any of the mosquitoes get inside! It takes only one bite to kill you!” Despite my father’s utmost effort to keep the mosquitoes out of our house, one of these sneaky little creatures would sometimes manage to get inside. What ensued then was my mother’s panic as she would cover me in insect-repellent creams. To an American reader, everything I have described until now may seem unusual, but it was a very ordinary evening at any household in my hometown of Dhaka, Bangladesh. Deadly mosquito-borne diseases such as malaria and dengue are common in Dhaka so people live in constant fear of mosquitoes. My family, like any ordinary family, was just trying their best to stay alive. The sky of Dhaka at evening. I wish I could tell you that the situation has improved since then, but unfortunately, climate change will increase the spread of mosquito-borne diseases in Dhaka. Bangladesh is one of the countries most vulnerable to the effects of climate change both because of its geographical location and economic conditions (1). It is a low-lying, tropical country bound by the Bay of Bengal in the south, by Myanmar in the Southeast and by India in the North, East and West. A developing economy that is densely populated, its 158,570,535 citizens live in an area of 147,570 km2 (2). As a frame of reference, Bangladesh is approximately the size of Iowa, but has about half as many people as the entire United States. Bangladesh’s capital, Dhaka, where I was born and raised, is the most crowded city in the world (3). The impending effects of climate change will surely exacerbate the occurrence of infectious disease and cause potentially significant public health challenges. Infectious diseases spread by mosquitoes, such as malaria and dengue, are endemic to the tropical Southeast Asian region. Dhaka’s poor infrastructure, such as a lack of drainage systems, waste disposal and the abundance of slums, create suitable habitats for mosquitoes and aggravate the effects of climate change on the spread of diseases (4). Human-caused climate change is responsible for an increase in the global mean temperature, a phenomenon also known as global warming. When I was a child, every summer when I complained of the heat, my mother recalled the time right after I was born in the summer of 1998. She fondly reminisced about the tantrum I had thrown as a newborn in that sweltering hot weather and the trouble she had to endure to pacify me. Later, my mother would come to find out that the temperature in 1998 was a record high at that time (5). To all my later complaints about the weather, she would say that the heat was nowhere as bad as that of the summer of 1998. However, as I got a little older, and especially during my teenage years, the summers became so unbearable that I never felt like stepping outside of the house. For the first time, I heard my mother say that every summer now reminded her of the summer of 1998 (5). For the months of May through September, an increase of 1℃ has been observed from 1976-2008 (7). This increasing trend in temperature is causing seasonal patterns to change in Bangladesh (7). Normally, the Bengali calendar has 6 six seasons that last for two months each. The seasons of Bangladesh in my memory have always changed in such a timely manner that it would make you wonder whether nature was following a clock. In my childhood, summers had sunny skies, an enjoyable warmth and the red hue of krishnachura flowers that brightened all of Dhaka. Summers used to be distinct from monsoon, which followed summer. The temperature used to drop during monsoon. However, nowadays summer and monsoon are converging into one season as monsoon starts earlier than before and the high temperatures of the summer prevail for a longer period of time. The streets of Dhaka in the summer months lined with Krishnachura. An increase in temperature generally facilitates the growth of the mosquito population. Warmer environments also speed up the maturity of the parasites they carry, which means that more mosquitoes also means a greater potential for disease transmission. Unfortunately, this increase in mean temperature favors both Anopheles mosquitoes, which transmit malaria, and Aedes aegypti, which transmit dengue fever (6). Aedes Aegypti mosquito, the carrier of dengue fever. Anopheles mosquito, the carrier of malaria. Lab experiments show that at consistent temperatures of 32-35 ℃, the incubation period of Aedes aegypti mosquitoes is shortened by a full week from its incubation period of 12 days at 30 ℃ (7). As temperatures increase in Dhaka then, we can expect an increase in the incidence of mosquito-borne diseases as the incubation period of mosquitoes decrease. In addition, average temperatures during winter are expected to increase by 1.4 ℃ by 2030 (7). This changing weather pattern will shorten the length of the reproductive cycle of mosquitoes, thus increasing the rate of population growth (8). Mosquitoes are not only helped by the increase in temperature, but also by the increased amounts of rainfall in Dhaka, which experiences the tropical monsoon climate. I have always had a love-hate relationship with monsoon. Even though the roads were muddy, and sometimes I was stuck inside the house all day during monsoon months, it was still a glorious time of the year. I was always excited about the loud rhythmic rattle of the rain and the clear green of leaves that you could see right after the rain stopped. But monsoon also meant knee-deep water that you sometimes had to wade through to get to school and being stuck in traffic for long hours because the rain water got into a car’s engine. Life in Dhaka during the monsoon months. The arrival of monsoon also evokes fear in the hearts of many because it is the season when the outbreaks of mosquito-borne diseases occur all over Dhaka. Analysis of rainfall from 1976-2008 showed an increasing trend in the amount of rainfall during monsoon (7). There has been a corresponding increase in outbreaks of dengue from June to August (2). 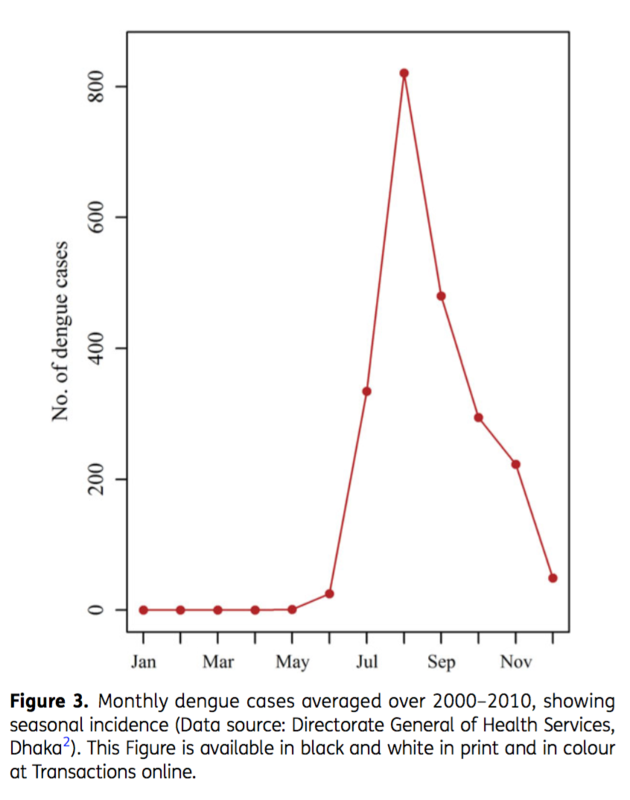 Data recorded over 2008 and 2009 shows that the number of dengue cases increase from around 50 to above 800 following the arrival of the monsoon during the months of June to August. This increasing amount of rainfall creates pools of stagnant water which become optimal breeding sites for mosquitoes. An increasing population of mosquitoes allows for a faster spread of diseases (8). The increasing amount of rainfall coupled with the increase in temperature will act together to increase the rates of mosquito-borne illnesses in Dhaka. Not only are the temperature and level of rainfall increasing, but the occurrences of weather extremes such as floods are also becoming more frequent. 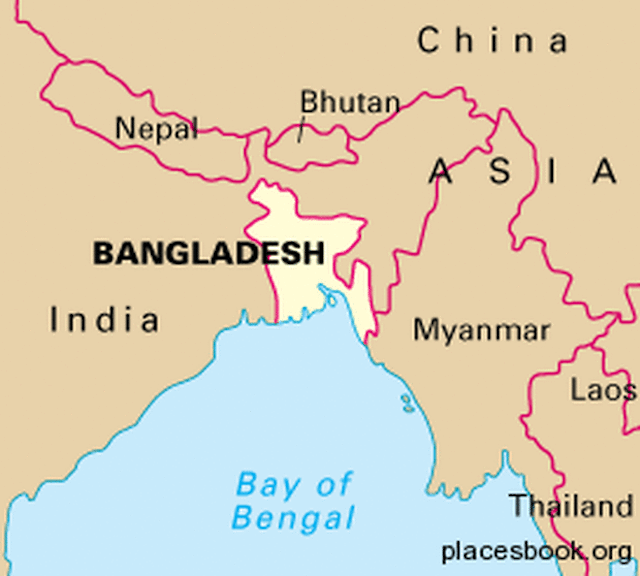 Bangladesh is located on a river delta plain fed by 230 rivers. In the north, the glaciers in the Himalayas are melting, while in the south, the sea levels of the Bay of Bengal are rising. Both the water from the melting glaciers and the rising sea levels make Bangladesh vulnerable to frequent flooding. A severe flood occurs in Bangladesh every four to five years, but this frequency is expected to increase with further climate change (2). A study has found that if total precipitation increases by 5%, an increased 20% of area in Bangladesh is likely to be flooded. In the past, outbreaks of dengue fever have occurred during a flood. Flooding causes water congestion in Dhaka which creates breeding sites for mosquitoes, thus mosquito populations grow which leads to an outbreak of dengue. As frequencies of flood increase with climate change, incidences of dengue fever is also expected to increase (4). Streets of Dhaka during a flood. Climate change has affected the rural agriculture-based economy of Bangladesh as changes in temperature, level of precipitation, and seasonal patterns damage crop production. This adverse effect on agriculture has forced a migration the rural areas to Dhaka, the economic hub of the country. These “climate refugees” live in slums, which lack good sanitation systems, a safe drinking water supply, and proper cooking and health care facilities (9). These substandard living conditions create the perfect condition for the spread of mosquito-borne disease. A shortage of reliable fresh, clean drinking water results in residents storing what water they have in containers such as drums and earthen jars. Unfortunately, these containers are not sealed, and so the Aedes aegypti mosquito lays its eggs in them, precipitating outbreaks of dengue in the city. As climate change continues to affect agriculture in rural areas more people will migrate to Dhaka. Without an improvement in both Dhaka’s infrastructure and the living conditions in these slums mosquitoes will have the ability to infect a greater number of people (4). Stagnant water bodies are breeding sites for mosquitoes. When I have trouble falling asleep at night, sometimes I wonder about the fate of Dhaka. Lying in my college dorm bed in Massachusetts, with not even a single mosquito in sight, I think about what will become of these mosquitoes in Dhaka. Could they wipe out the entire population of Dhaka in the next 20 years? Or are they going to mutate to become some super-mosquito creature which will take over the world? Sometimes I have a dream, or rather a nightmare, that I am walking through the streets of Dhaka in a quarantine suit and everybody else is dressed similarly. In my dream, I cannot really recognize the faces of anyone because millions and millions of mosquitoes are buzzing in the air. You may say that my dream is too far-fetched, but how much better could the reality be? -Bushra Tasneem (’20) is a Mathematics and Computer Science double major from Dhaka, Bangladesh. She enjoys reading poetry and taking walks in the woods in her free time. She originally wrote a version of this piece for ENG 119 Writing Roundtable This Overheating World. Dastagir, M.R. ; Modeling recent climate change induced extreme events in Bangladesh: A Review; Weather and Climate Extremes. 2015, 7, 49-60. World Economic Forum. https://www.weforum.org/agenda/2017/05/these-are-the-world-s-most-crowded-cities/ (accessed April 13, 2018). Sharmin, S.; Viennet, E; Glass K.; Harley, D; The emergence of dengue in Bangladesh: epidemiology, challenges and future disease risk. Royal Society of Tropical Medicine and Hygiene. 2015, 109, 619-627. Stevens, W. Earth Temperature in 1998 Is Reported at Record High.The New York TImes, Dec 1998. Yi, H.; Devkota, B.R. ; Yu, J.; Oh, K.; Kim, J.; Kim, H.; Effects of global warming on mosquitoes & mosquito-borne diseases and the new strategies for mosquito control. Entomological Research.2014, 44, 215-235. 7.Basak, J.K.; Titumir, R.A.M. ; Dey, N.C.; Climate Change in Bangladesh: A Historical Analysis of Temperature and Rainfall Data. Journal of Environment. 2013, 2, 41-46. Bostan, N.; Javed, S.; Nabgha-e-Amen; Eqani, S. Tahir, F. Bokhari, H.; Dengue fever virus in Pakistan: effects of seasonal pattern and temperature change on distribution of vector and virus. Review of Medical Virology, 2017, 27. Molla N. A.; Mollah K. A.; Ali G.; Fungladda W.; Shipin O.V. ; Wongwit W; Tomomi H; Quantifying disease burden among climate refugees using multidisciplinary approach: A case of Dhaka, Bangladesh. Urban Climate, 2014, 8, 126-137. 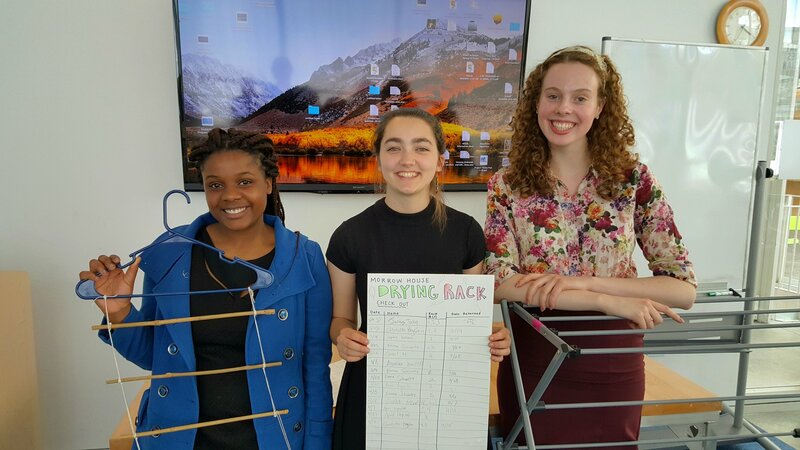 The House Sustainability Challenge culminated its first chapter with a final winner: the Drying Racks team (Yolanda Chigiji ’21, Julianne Borger ’21, Emma Krasky ’21, Sadie Wiese ’21, April Hopcroft ’21 and Sophie Guthrie ’21). Congratulations! This group presented a practical alternative to drying machines and made it available to everyone in their house (Morrow-Capen) on a trial basis. Here’s how it went- they displayed several prototypes made out of inexpensive, recycled materials, such as bamboo, to their house community and encouraged their creation through small workshops. As a back-up, in case a DIY drying rack was not within the skillset or comfort zone of students, they made sure to have some standard designs on each floor of the house. These racks were managed with a sign-out system so residents on each floor are aware of who was using which drying rack at any given time. In case of a lost or damaged frame, the person, whose details was on the sign-up sheet, was contacted and the situation was assessed. Through the use of portable racks, the students were able to reduce the number of dryers in use over their trial period by almost 200 cycles in both houses. The House Sustainability Challenge, sponsored by Smith’s Conway Center for Innovation & Entrepreneurship, Residential Life, CEEDS, the Office of Campus Sustainability, and The Design Thinking Initiative, held its final challenge on April 20th, allowing each group to present their proposals and pilot programs to the judges. The winning team was awarded $1,000 while the remaining finalists received $250 for their respective houses. The winning team’s design for a campus-wide drying-rack program will be implemented next semester. The House Sustainability Challenge was developed as a way to encourage students to use their expertise as residents to help envision and design innovative ways of solving real life issues on campus in an environmentally sustainable manner. Design solutions must also be economically feasible and replicable across the residential houses. For this year’s House Sustainability Challenge (2017-2018), I teamed up with my classmate, Yuging Geng (’21), to design a project that could potentially increase the environment-friendly initiatives on campus. 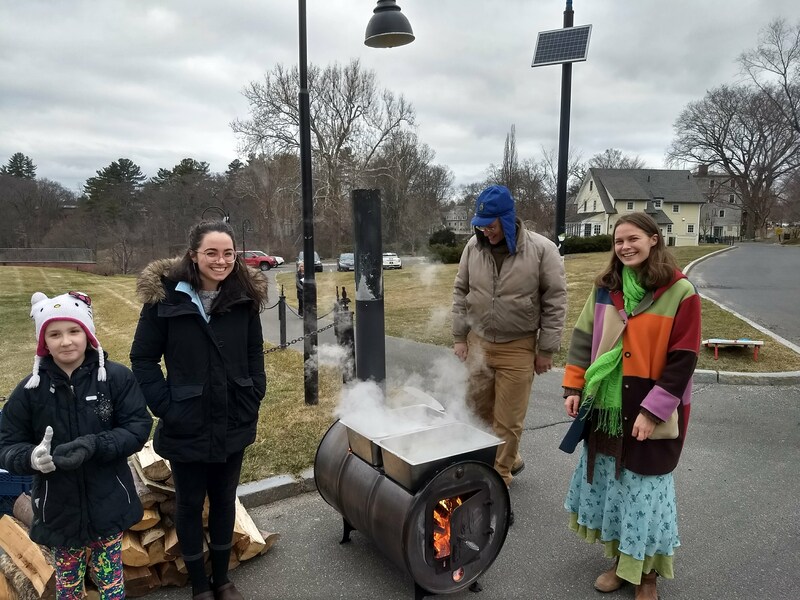 Living in Massachusetts, cold, winter-like makes up much of our academic year, making our heating systems a potential source both for energy savings and for improvement of personal comfort. Before moving to Ziskind, where I currently live, I was in Sessions House where my room felt significantly colder. However, closing my window disrupted my only source of fresh air, with the result that I often had to put on extra layers of clothes or purchase additional blankets to keep myself warm and comfortable. In Yuging’s house, Chase-Duckett, she noticed that her friends had variable temperatures in their rooms. For example, one of Yuging’s friends felt uncomfortable because it was too cold, while another friend’s room felt significantly warmer, sometimes even too warm. 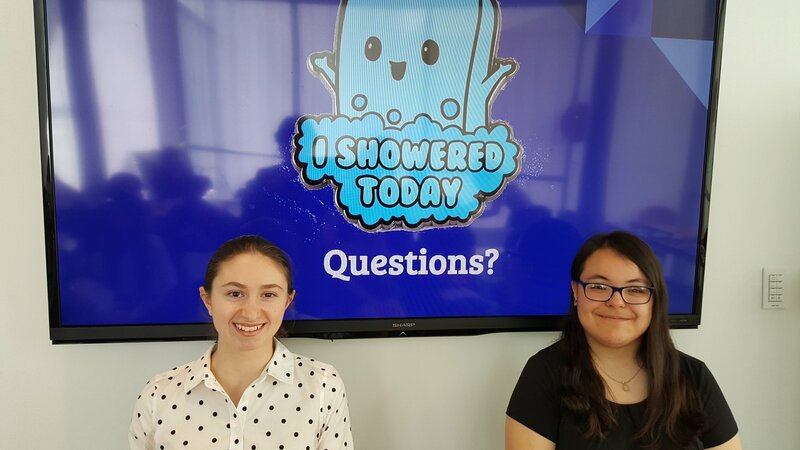 Based on these experiences, when the call went out for the Sustainability Challenge, we decided that students would benefit from a system in which they could view their dorm-room temperature so they could make better informed decisions about when to contact facilities to request a change in temperature. 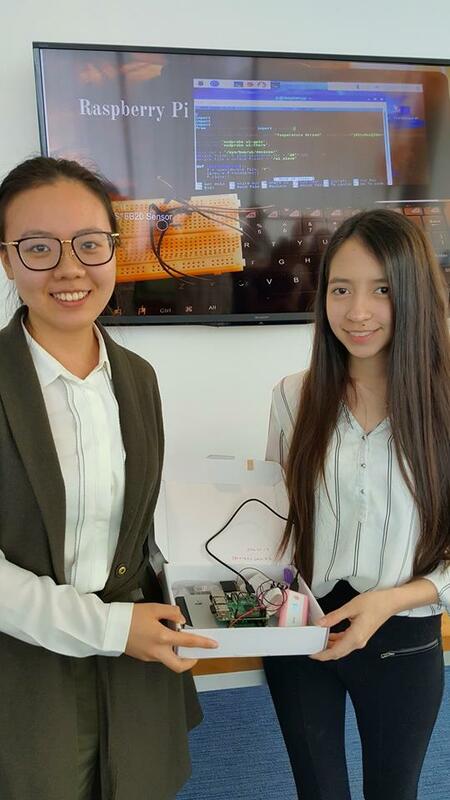 We decided to wire in a breadboard, a temperature sensor (DS18B20), to Raspberry Pi 3 and code it, using Python, to collect temperature data and display it on a website (i.e. livestream). An additional benefit of using Raspberry Pi is that no changes in the infrastructure would need to be employed, as its performance mainly depends on Wi-Fi. Since we are both international students, we calculated the temperature in both Celsius and Fahrenheit. We envisioned this project as an early tool to raise awareness not only about campus heating systems, but also about the lack of ventilation during the summer. Take a look at our prototype website: https://melaraerika.wixsite.com/sustainchallenge for more info! 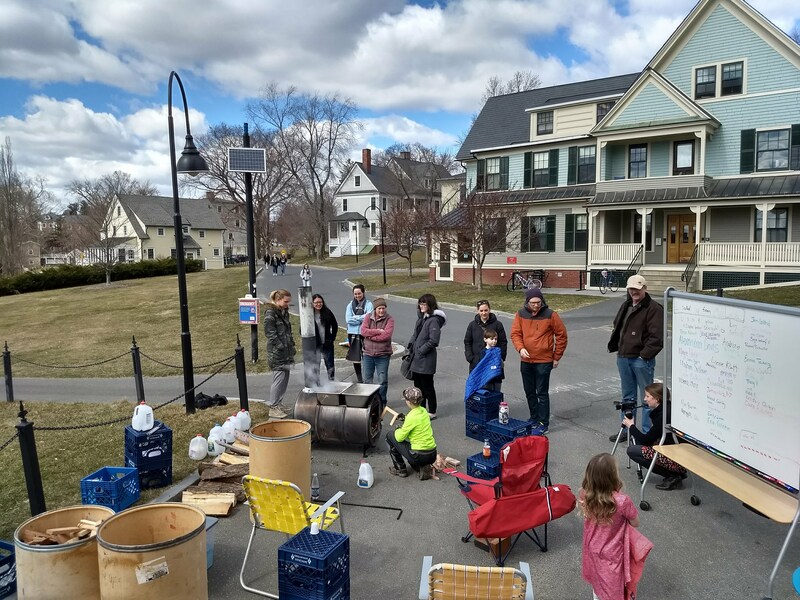 This year’s House Sustainability Challenge was sponsored by the Conway Center for Innovation & Entrepreneurship, the Design Thinking Initiative, the Office of Campus Sustainability, CEEDS, and the Office of Student Affairs. 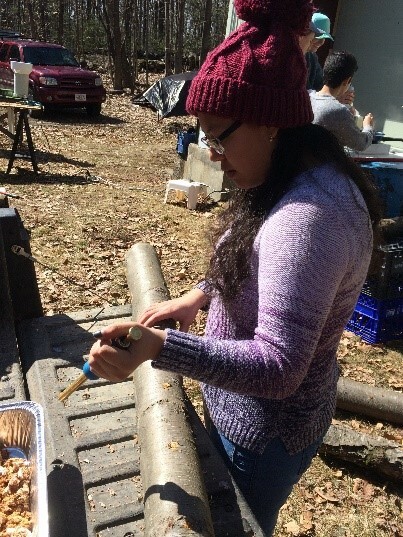 -Erika Melara ’20 is a Scorpio who is happy that winter is finally fading away! Spring is well and finally here! 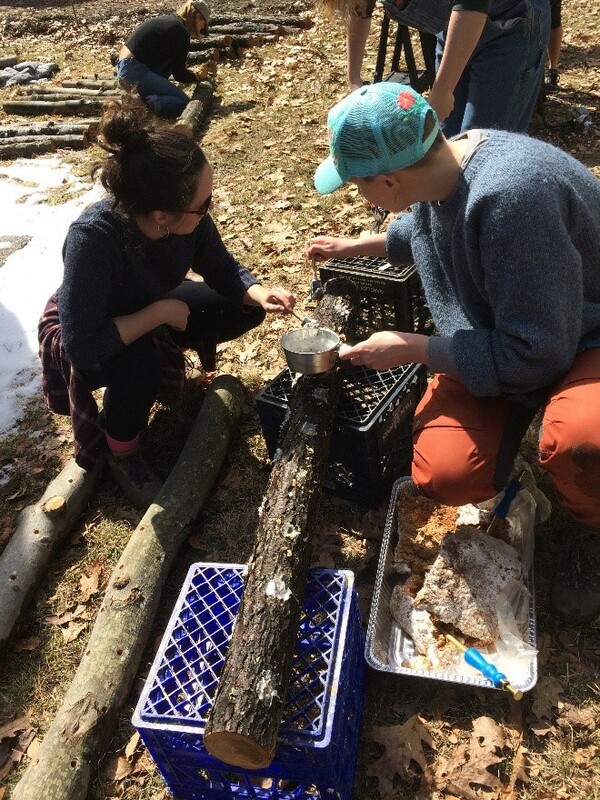 We’ve been celebrating its arrival with students in New England fashion- by taking a bunch of them to a local sugar shack for a tasty breakfast with the locals- and by taking others out to the MacLeish Field Station to learn how to first identify and then tap maple trees so we can gather their sweet sap. As the days slowly get longer and the daily temperature swings signal that it is time for the trees to send food to their flower and leaf buds, the slow and steady drip of sap has gotten faster and faster, filling the buckets easily each day. Check out the video about this that our intern Ellen Sulser ’18 made and posted on FaceBook. On Sunday we capped off the season by hosting our inaugural Smith Sugaring event. We brought to campus all of the sap we had been gathering and set up near Chapin House. 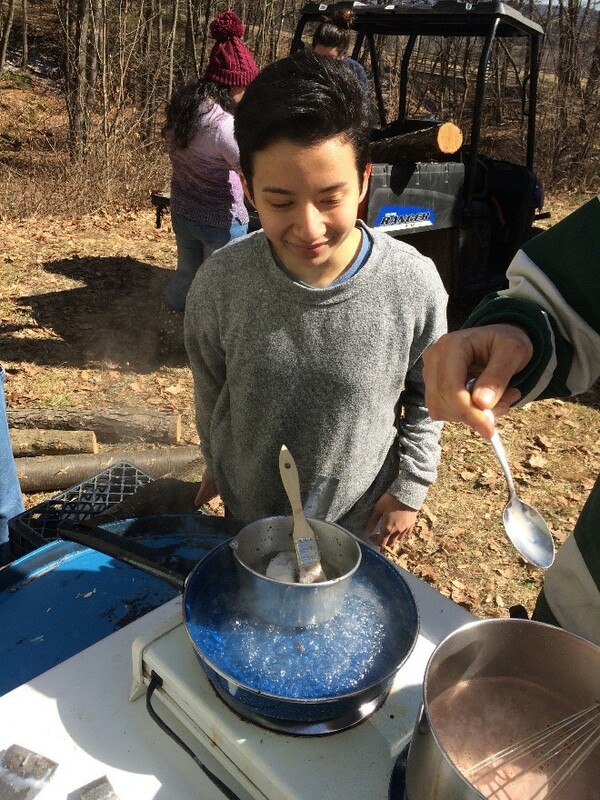 It was a perfect day to hang out and watch the water boil off and share with passers by the wonders of making maple syrup. 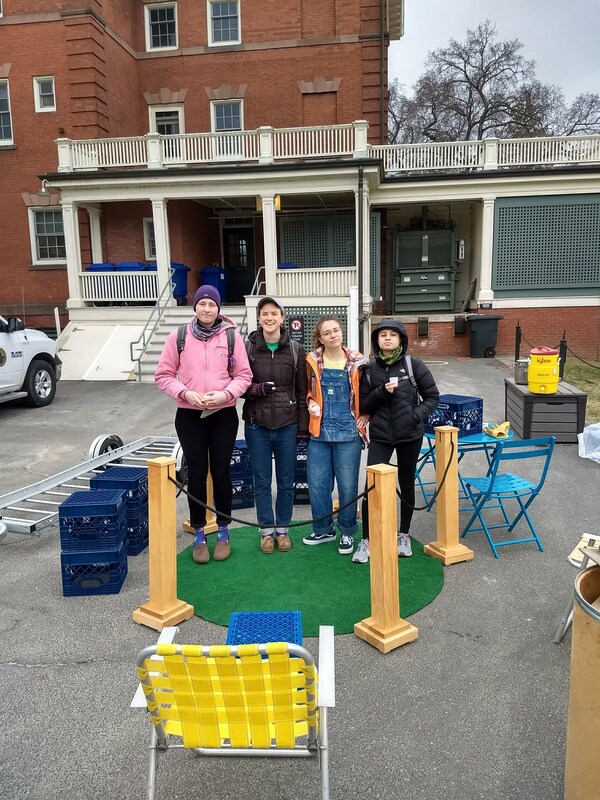 Some seniors (environmental concentrators, all) stopped by to check out the parklet that we had set up nearby. And lots of other people (200 or so by our count) stopped in throughout the day to visit, check out our set-up, learn about the process, and taste some fresh maple sap or syrup. 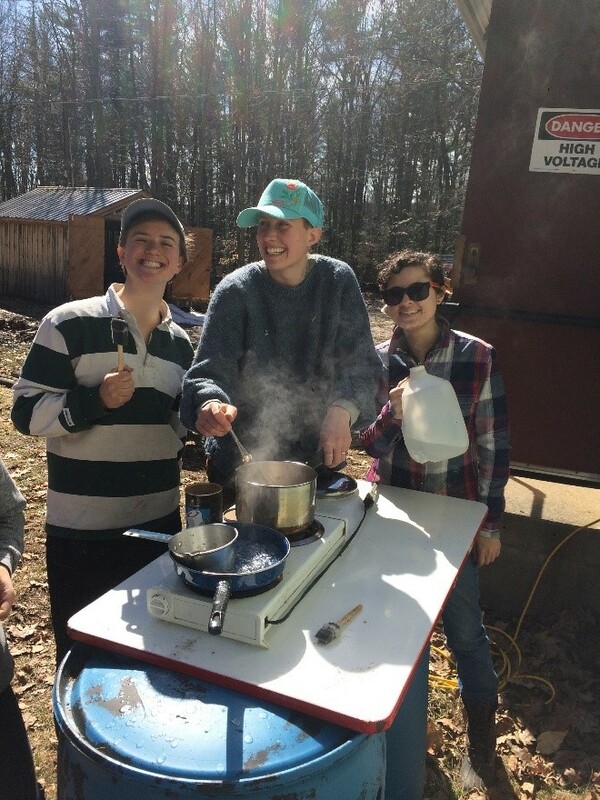 We made our very first MacLeish maple syrup here on campus, and a good time was had by all. Sweet success!